2. I use my stand up mixer for this recipe with the bread dough hook. 4. Combine the water and salt. Mix until salt dissolves. Add to bowl with flour and yeast. Mix together on medium speed. 5. Add the remaining flour and mix on medium speed. I mix for 4-5 minutes. 7. After first rise, punch down and cut the dough in half. Cover and let rest for 10 minutes. After 10 minutes, take each dough and roll out into a 12×15 rectangle. Roll dough tightly from long side of rectangle, sealing as you roll. Taper the ends of the loaf. Top with egg/water wash.
9. Bake for 30-40 minutes. After that you will have a simple and delicious bread! 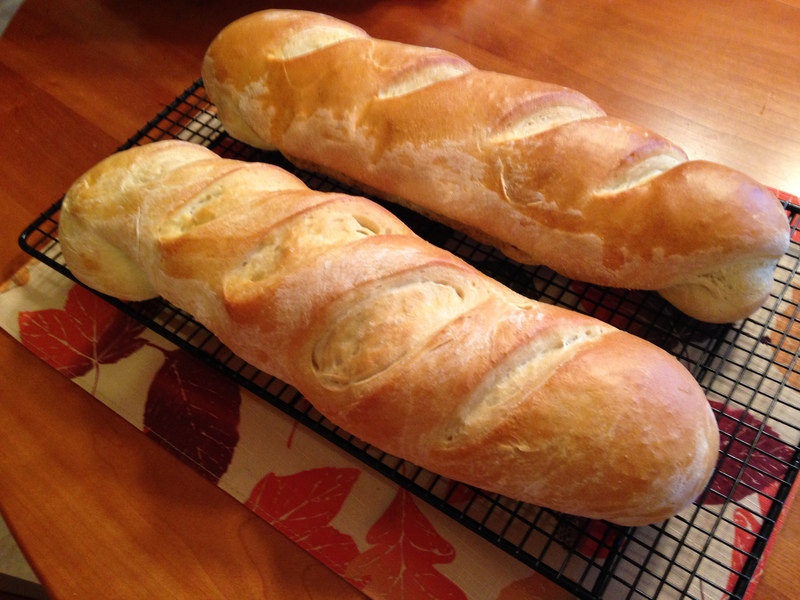 Sometimes I will make one loaf of bread and take the other dough and make dinner rolls. Believe me this bread gets eaten in this household!! Every Sunday I make dinner for all of us. It is very informal. I like informal. No pressure. That is what weekends are for!! Sometimes Eric & Rachel, Martin & Martin, Lily & Paige show up, sometimes they don’t. Eric shows up most Sundays. 🙂 Just depends on what they are up to. Needless to say I always have a family meal on Sunday, no matter who is here! I decided to make these Chicken Parmesan Sliders. I also made the Chick Fil A sandwich along with it. They were both big hits. I used 2 different kinds of rolls. I bought the Kings Hawaiian Savory Butter Dinner Rolls as the recipe suggested. I also made the hamburger/dinner rolls I previously posted. The home made buns won the taste test. Here is the recipe for the Chicken Parmesan Sliders. 1. Preheat oven 400 degrees. Place rolls on a cutting board, using a serrated knife, cut rolls in half lengthwise. Open rolls and place tops on one side of the baking sheet and bottoms on the other side, cut side up. 2. Melt butter in a small microwave safe bowl, stir in garlic powder. Brush butter on cut side of bread. Bake bread for 8-10 minutes until bread is lightly golden brown. 3. Prepare chicken by slicing the thickest part of the breast about 1/2 inch thick. (As I mentioned, I pounded the breasts to 1/2 inch thick). Cut the breasts into pieces that will fit on the rolls. 5. Cook until browned, about 4 minutes each side. 6. Remove bread from oven. 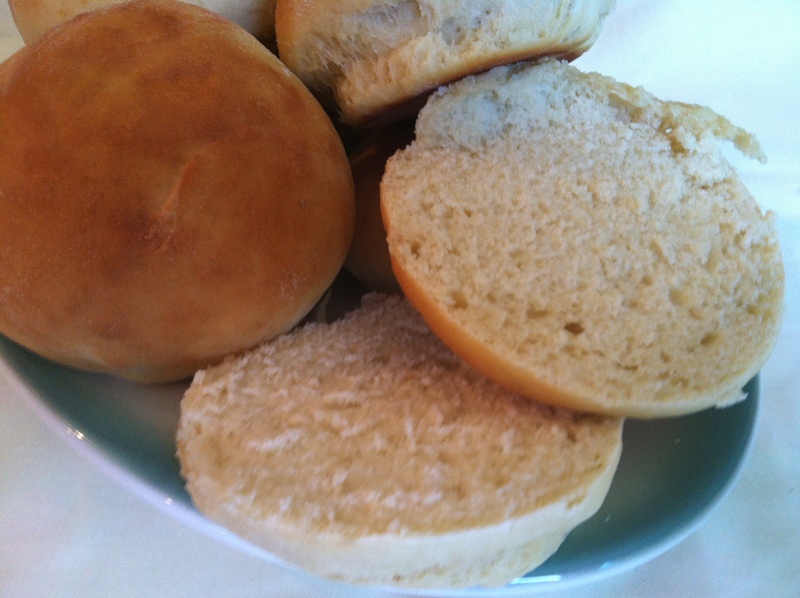 Carefully remove top halves of rolls and place on plate. Set aside. Sprinkle Parmesan cheese over the bottom halves. Top with cooked chicken pieces. Drizzle each chicken piece with 1 Tablespoon of sauce and top with mozzarella cheese. 7. Bake 5 minutes or until cheese is bubbly and melted. 8. Place top halves back on chicken. Serve and enjoy! This was simple and very delicious. Huge hit here. Give it a try!! I was surfing the internet and came across a hamburger bun recipe. I was going to pass on it but decided to give them a try. These were so easy. I did not deviate from the recipe. These went great with grilled chicken and hamburgers. Update – November 2013; I make this recipe ALL the time. We use it for dinner rolls, sliders, hamburgers and any kind of sandwich. When I make dinner rolls I roll out the dough. I use a pizza cutter to cut into dinner roll sizes. Then when they come out of the oven you just break them off. 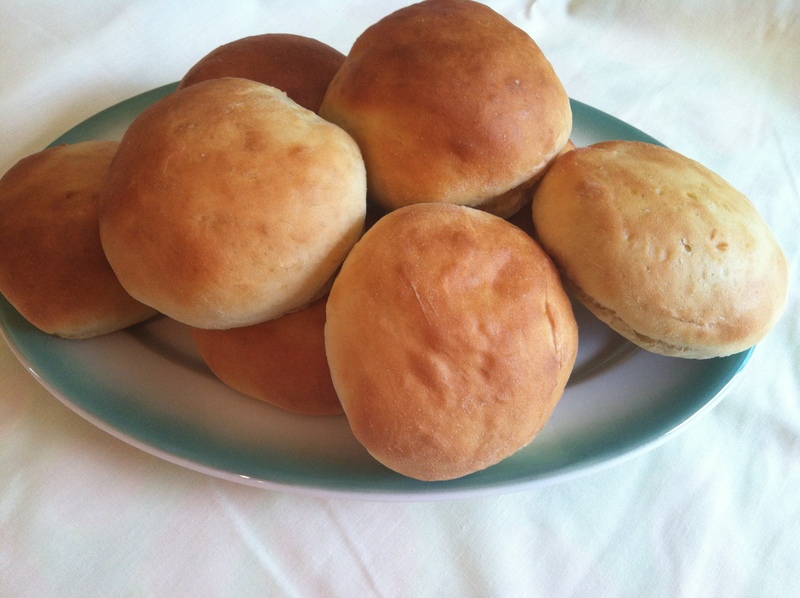 Home made dinner rolls. Simple and Delicious!! UPDATE: I decided to use 1/4 cup melted butter and 1/4 cup of vegetable oil in place of the 1/3 cup of vegetable oil. 2 Tablespoons sugar vs 1/4 cup sugar. I let the dough rise for 10 minutes or 30 minutes. I do not think the rising part makes that big of a difference. Using the butter/oil combination makes the roll denser. We like with just the vegetable oil also but that roll is lighter. For my slider rolls I use the vegetable oil only. Bake at 425 degrees for 8-12 minutes or until golden brown. Remove from baking pan to wire rack to cool. 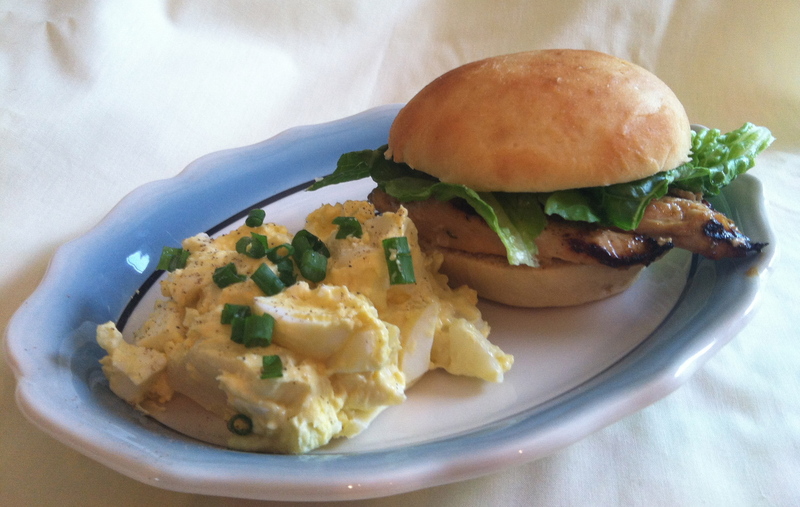 For lunch; Mediterranean grilled chicken with lettuce on a hamburger bun with potato/egg salad!